What do United Methodists Really believe? Is Mainstream Selling Us Downstream? Are Traditionalists Only a Small Group Within the Denomination? A Matter of Belief or Action? What is the Modified Traditional Plan? Why Is an Exit Path Necessary? Why do so many bishops support the One Church Plan? Is History an Argument for the One Church Plan? Is the Traditional Plan Unconstitutional? Is the Traditional Plan Punitive? What Is a “Good” Witness? Is the One Church Plan Unconstitutional? What’s in the Traditional Plan? What’s In the One Church Plan? By way of clarity, Good News has been a charter member of the Evangelical Council of Financial Accountability (ECFA), an agency that provides accreditation for Christian nonprofits for compliance with established standards for financial accountability, fundraising, and board governance. The goals and vision of our ministry have never been secret. 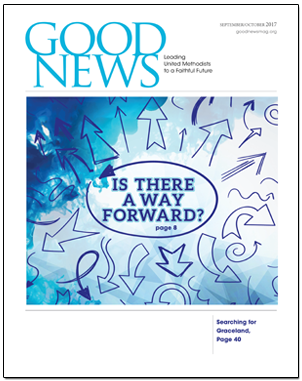 Good News has faithfully participated in every denomination-wide dialogue on the issues facing The United Methodist Church. Our perspectives, opinions, and alliances have always been matters of public record. The same article claims that the bishops are settling on option 2, but like the church they are heavily divided, just in the opposite direction of the delegates to the general conference. In another article quoting bishop Ough the key word seems to be contextualization (ie option 2). Progressive websites have made it clear that option 2 is only a stepping stone to full gay inclusion. The publically stated goal is to use option 2 to drive out enough conservatives from the denomination so that the progressives can take over. The only question now is who will propose an alternative that must limit the power of bishops to ignore the book of discipline and take away their power, or will Adam Hamilton and his group be able to fool enough people into thinking the Christian thing is to just get along. Expect heavy and well funded campaigning on this point . I understand they are already sponsoring a resolution to every annual conference this year. I have real doubts that the squishy middle of our church will stand up. I pray for the best, but am preparing for an early retirement. Only a few people in the Pew knows what is going on. Only Church pastors and some staff know and Church officials that has kept up with the COB & Way Forward to their position and representation status are aware. Most Churches are not informed and will be surprised when 2019 get here. I brought this topic up after worship in a small class,and not to my surprise all did not see any problem w/ full inclusion. One even defended the move with the abolishment of slavery. I think we can look forward to a lot of false statements over the next few months. Better get used to it. Cynthia’s article is now gone from her website with neither explanation for its removal nor apology for its content. Before she deleted the article, she added a few paragraphs at the end stating that IRD and Good News deny the allegations made by retired Bishop William Lewis. Then she provided links to the IRS Form 990’s for Good News and IRD, along with a conspiratorial note that these non-profit forms did not contain sufficient information to prove that the allegations were not true. She then took a swipe at WCA questioning why their form was not publicly available on these sites (clearly not realizing that the website contained forms only up through 2015). (As an aside, I had no problem tracking down the WCA info showing $0 for contributions and expenses in 2015 which is probably why it wasn’t on the other website.) She concluded by not too subtly implying that both organizations could potentially be hiding something since neither publicly releases their donor lists. In other words, there was no apology or correction. This states that the Commission on a Way Forward dropped Option #1. The two options listed here are a local option plan and a three branch church plan —- either of which would be a DISASTER for the church. But, the biggest disaster and disgrace is the leadership of our church contemplating plans that contain a rejection of God’s plan for marriage and sexual morality. Copyright © 2019 · GOOD NEWS. · All Rights Reserved.